Minigarden Basic is the simplest and easiest system, of the MiniGarden family, to use. 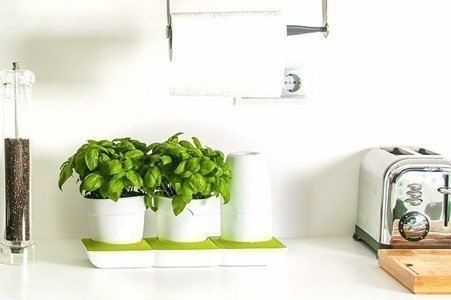 Thanks to an ingenious system for storing water with nutrients and irrigation, Minigarden Basic allows ornamental plants, herbs or small vegetables to be grown and maintained without the need for daily care. The system ensures regular irrigation and nutrition according to the plants’ needs. Minigarden Basic is composed of just 6, easy to assemble components: a watertight platform at the base, 2 lids with a round opening into which the pots are inserted, a round base to support the reservoir, a removable reservoir for water and nutrients, a feeder lid and a geotextile underlay to be placed inside the watertight platform. Minigarden Basic is ready to be fixed and suspended on walls by means of a bracket that slots into the drains on the watertight platform of the base. Its assembly is extremely simple and intuitive, allowing 2 types of configuration. Like MiniGarden and MiniGarden Corner, MiniGarden Basic is also made of high-strength polypropylene copolymer and contains additives to protect from UV rays, making it capable of withstanding extreme climatic conditions (solar radiation and temperatures), and is guaranteed to last for a period of not less than 10 years. It is also reusable and totally recyclable. 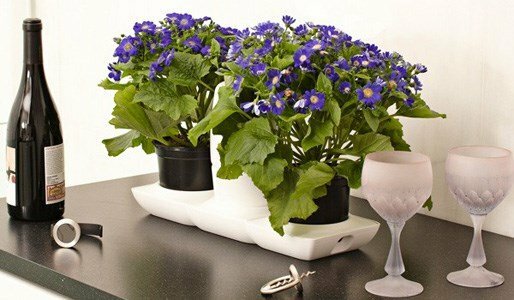 MiniGarden Basic, plant without messing your hands!